An individual has filed a trademark application to register the mark “WORMSOX” for use with apparel including polo shirts, sweaters, t-shirts and tank tops. He is now facing an opposition, filed with the Trademark Trial and Appeal Board, and submitted by the Boston Red Sox. The baseball franchise owns numerous registrations attached to marks that contain the word “SOX,” which span a variety of classes of goods and services, including the category that encompasses apparel. Those registrations have been held by the Red Sox for so long that they have been established as “incontestable,” adding to the strength associated with said registrations. The Red Sox point out that not only are the goods closely related, but the applicant for the registration to WORMSOX is based in close proximity to where the Red Sox play home games. The applicant is a resident of Somerville, Massachusetts, which is located very close to Boston. 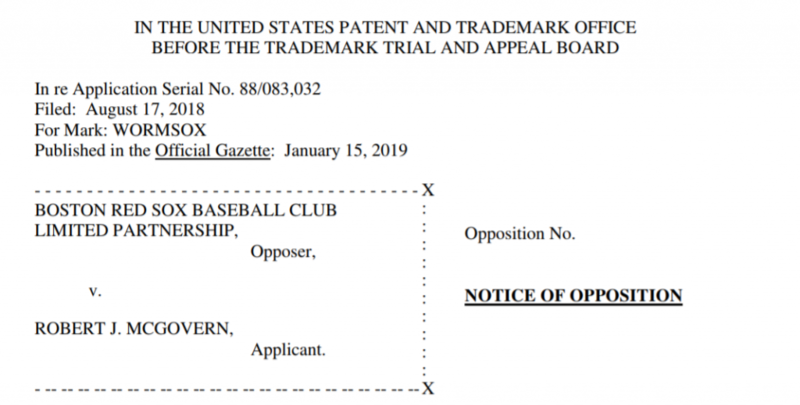 It looks like a good case for the Boston Red Sox, which is a franchise that has experience handling these types of trademark oppositions. In September 2018, the Red Sox filed an opposition against individuals seeking to register the trademark “HAZEL’s GREEN MONSTAH RELISH.” The Red Sox prevailed, because the applicants never responded to the notice of opposition.